Guest Post: Adam Kings' Spring Picks! Magnolias and Sunlight: Guest Post: Adam Kings' Spring Picks! As the weather starts to transition into spring I can’t help but get excited to shop. It seems like every year spring rolls around I fully embrace the saying “out with the old and in with the new.” Here are some of my top picks for my 2016 spring wardrobe. As some shy away from horizontal stripes, I run towards them! I love this striped dress from H&M because it is so versatile and can be styled in a bunch of different ways! Now, while the dress is at a great price, these Stella McCartney sunglasses are a bit more pricey but I have a bit of a sunglasses obsession. As many of you know, Pantone announced Rose Quartz as the 2016 color of the year and ever since I’ve seen the pale pink color all over. These glasses are a great way to incorporate the color of the year into your wardrobe! 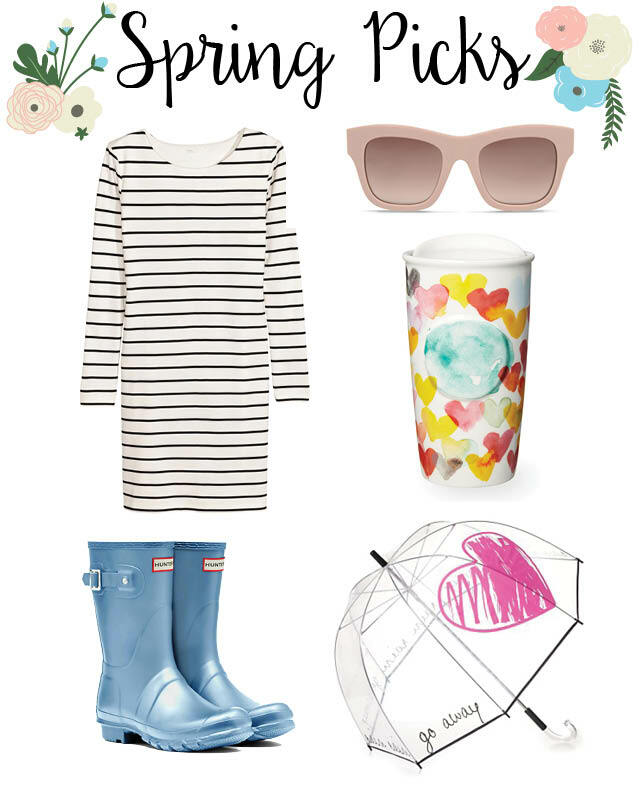 Spring showers are coming and on the days you need to turn in your sunglasses for an umbrella, it’s great to have something that is fun and flirty to take away from the dreary weather. This umbrella was designed by the Felix Rey co-founders, Lily Rafii Band and Salaika Zarrouk. You might know Lily as wife of business consultant Doug Band, who may be the inspiration for this flirty line! With an adorable umbrella, you need just as cute rain boots. I love the short hunter boots and the pale blue color is perfect for spring. So I will admit, I have about 10 different travel mugs. I know it’s crazy; I have a bit of a mug problem! Every morning I pick out my travel mug to fit my mood and/or outfit. This mug from Starbucks is great for those mornings when spring blooms are in the air!